On this cross-country trip, we’ve already been rewarded twice with the unexpected — stuff going on we had no idea of, until the very moment that we stumbled right into it. One of the joys of a spontaneous journey. Remembering the Alamo -- 175 years on! Take last Sunday. We had no idea of the import of March 6 in Texas history — until we took the bus to a tour of the Alamo. All these guys in period dress: What’s going on? 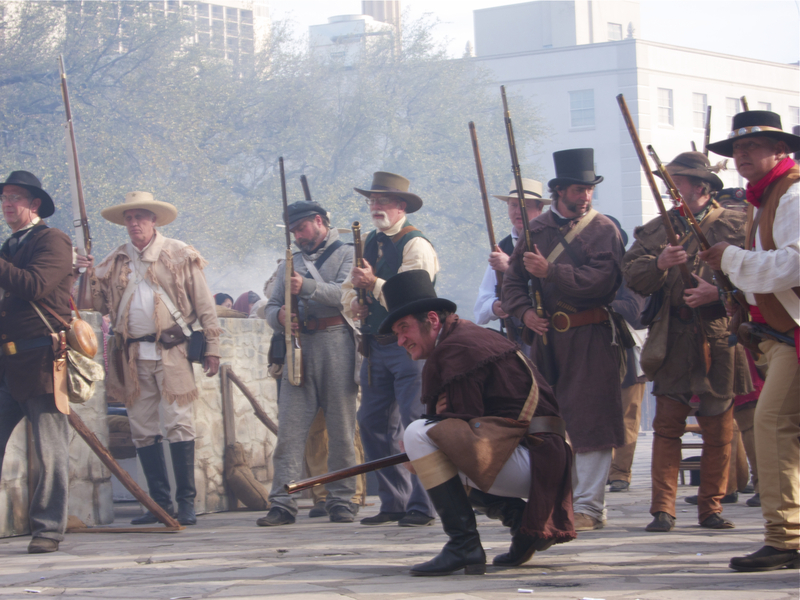 The celebration of the 175th anniversary of the fall of the Alamo! And so we got to enjoy a re-enactment of the siege and the fall. In adversity at the Alamo, Texas found its inner strength and soon prevailed at the Battle of San Jacinto. Then yesterday. We had arrived in Natchez with the hope of driving past, just seeing, some old antebellum mansions. But it turns out Saturday was the opening day of Pilgrimage, the five-week stretch when the finest preserved mansions of old Natchez — a center of extraordinary wealth in the days of King Cotton — are open for public tours. Again, Who knew? So we got to go inside and visit with folks who live in mansions we had only hoped to drive past. What can you say about a structure, its occupants and a locale where the same family has lived amid the same furniture in the same house since 1849? It’s not so much the land that time forgot as it is people who don’t want to forget. So serendipity had struck again, and we consider ourselves blessed to have had these two small but enriching surprises. Have you ever noticed that when good things happen in life, no one ever wonders, Why me?